A number of liberal and Christian politicians and public figures have condemned US Secretary of State Hillary Clinton's visit to Egypt, accusing the United States of harbouring bias towards Egypt's Islamist parties, especially the Muslim Brotherhood. This has coincided with several popular demonstrations against Clinton's visit outside the US embassy in Cairo, the presidential palace and the Four Seasons hotel in which Clinton is staying. 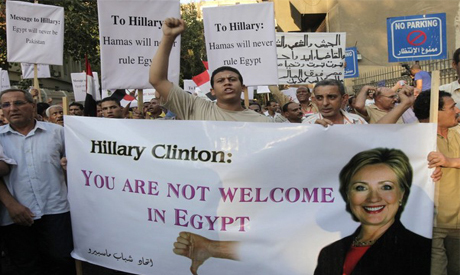 Liberal parties and movements, including the Free Egyptians party and the Front for Peaceful Change, have participated in the protests against Clinton's visit, which have recently shifted from the US embassy to the presidential palace. They were joined by other political forces opposed to Egypt's revolution, including supporters of Mubarak-era vice president Omar Suleiman. The Front for Peaceful Change, a pro-revolution youth group, issued a statement on Saturday calling on the Egyptian public to participate in the protests to register its rejection of perceived US interfere in Egypt's affairs and its alleged deal-making with the Muslim Brotherhood. Accusations of a secret agreement hammered out between the US and the Brotherhood is a common refrain among the opponents of Clinton's visit. Emad Gad, a Coptic-Christian member of Egypt's dissolved lower house of parliament for the Egyptian Social Democratic Party, saw Clinton's visit to Cairo within the context of an alleged US-Brotherhood deal through which Brotherhood candidate Mohamed Morsi assumed Egypt's presidency. "In exchange for Morsi's being named president, the Brotherhood is expected to protect Israel's security by pressuring Hamas – the Brotherhood's branch in Palestine – not to launch military attacks against Israel, and even accept a peace agreement with Tel Aviv," Gad told Al-Ahram's Arabic-language news website. Gad, a prominent political analyst, added that the US was also supporting the Brotherhood in return for maintaining Mubarak-era agreements not to restore ties with Iran, which, he said, would pose a threat to the self-proclaimed Jewish state and America's allies in the Gulf. Gad went on to say that the protests against the Obama administration's alleged deal with the Brotherhood would be used by the US Republican Party in upcoming US presidential elections to show how the administration's alleged deal-making with Islamists were harming the region's non-Islamist political powers. A number of Christian politicians – including Gad, rights activist Michael Mounir, former MP Georgette Qeleini and business tycoon Naguib Sawiris – also refused to meet with the US state secretary during her brief visit to Egypt. In a joint statement on Sunday, they expressed their displeasure over Clinton's decision to meet with members of Egypt's Coptic-Christian community following earlier meetings with Muslim Brotherhood members and Salafists. They asserted that Clinton's move served to "promote sectarian divisions." Mohamed Habib, the Brotherhood's former number two, also slammed Clinton's visit, albeit for different reasons. Speaking on Twitter, Habib commented on US promises to support Egypt economically, asserting that Washington was "not a charity or reformist institution." "The American administration has a longstanding project aimed at dividing the region and securing the existence – and supremacy – of the Zionist entity," Habib declared. According to Manal El-Shorbagy, political science professor at the American University in Cairo, Clinton came to Egypt to negotiate with the country's new president – not with a single party or group like the Muslim Brotherhood. El-Shorbagy, for her part, believes claims of a covert deal between the US and the Brotherhood are nonsense. "She came to study conditions in Egypt and preserve American interests in Cairo," El-Shorbagy told Al-Ahram's Arabic-language news website. She added that it was "silly to believe" that Washington had pressed Egypt's military council to hand executive power over to the Muslim Brotherhood, as many of the latter's opponents are claiming. She went on to describe the protests against Clinton's visit as a "natural reaction," saying that post-revolution Egypt was "different from Egypt under Mubarak." El-Shorbagy believes it is "too early to predict" the future of Egypt-US relations, which will depend entirely on which US political party – Democrats or Republicans – captures the presidency in upcoming elections. Secty. Clinton is an honest broker seeking only what is best for all Egyptians and the Egyprian army is a key player in seeing to it through the elected government. I remember back in 2010 a blogger on Al Jazeera by the name of Kermit Roosevelt (a nickname? ), said something l've never forgoten; "kill all the sand niggers and give the Middle-East for israel to rule". I was in choc and complained to the editor. I can see today he knew of the plans. Clinton's Visit to Cairo right after the ascendency of the new president Dr. Norsi to power could be signified into many contradictory opinions, One thing for sure is that US adminstration is always been after securing its interests in the Middle East particularly after the prevalence of the political Islamic powers in Norh Africa and the MENA region. The sudden visit of Hillary to Egypt is liable to be condemned at all levels in the peculiar circumstances obtaining now a days as she has nothing to do except to conspire against the newly formed government under the dynamic leadership of his Excellency Mr. Muhammad Mursi, President of Egypt as she had a meeting with the military leadership of Egypt for no cause but for hatching a conspiracy. Egyptians be ware of American officials. Hillary Clinton is a Zionist and is not to be trusted by anyone, neither Christian or Muslim.